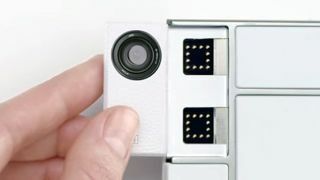 Toshiba has shown two camera modules that it's making for Google's unique Project Ara modular smartphone. The modules can be swapped in and out of an Ara handset, allowing you to easily upgrade the snapper on your smartphone. The two modules that were shown off by Toshiba were 5MP and 13MP snappers, both of which can be quickly installed into a Project Ara handset as the main rear cameras. Toshiba is also working on a front-facing 2 megapixel camera. Although we should be seeing an early version of Project Ara later this year when a pilot test program launches, according to a Toshiba development plan we won't see the camera modules until 2016. Toshiba's Senior Vice President and Chief Technology Officer Shardul Kazi has indicated that the company's modules will range in price from $50 (around £32, AU$65) to a quite staggering $500 (£325, AU$650), so we should see non-camera modules from Toshiba in the future as well. The ability to simply swap out and upgrade parts of the smartphone makes Project Ara an incredibly exciting device, and it's encouraging to see big names like Toshiba supporting the project. Will Project Ara snap into place at MWC 2015?